The Moon Tracks Gang frequently (almost daily) receive questions about "How do I adjust time on your site." Sometimes we get emails from people who demand that we create pages specifically for their region (not even a please and thank you), because they cannot figure out what time zone they live in, or how to "add" or "subtract" time from the times indicated on specific pages. First and foremost, if it was easy, we would do it in a heartbeat. But it would take way more time for us to create 30 (literally) different time zoned pages, for each and every table and calendar, than it would ever be worth. Hence, we have created this page. And from now on, when we get these types of emailed questions, this URL/page will be our answer to these questions. You want Personalized Times? Our Fees based on Time Expended. If you want to pay us to create the tables/calendars for you and your time zone, we charge $10 [United States Dollars (USD)] per quarter-hour ($40 USD/hour) to put that information together for you. We will only utilize Tropical Placidus (Western-based Astrology) calculations. If you want other forms of Astrology charted, i.e. Arabic, Babylonian, Celtic, Chinese, Egyptian, Heliocentric, Hindu, Islamic, Jyotish, Katarchic, Mayan, Persian, Tibetan, Vedic, etc., it is strongly recommended that you use a search engine of your choosing to find the resources that can assist you to meet your specific needs. Our Moon Tracks Crew will NOT be that resource. NOTE - We Will Only Accept Payment via PayPal.com and We will Create the PayPal Invoice for you, upon Request. Time and Date developed a great resource for people who are Time Zone Challenged. The map is color coded with rainbow-isque pastel colors and if you move your mouse/cursor over the regions on their map, it will "fairly" closely line up with the time zone numbers below that region. Note that the alignment is not precise because, the world really is a round orb that does not neatly flatten out for alignment purposes. 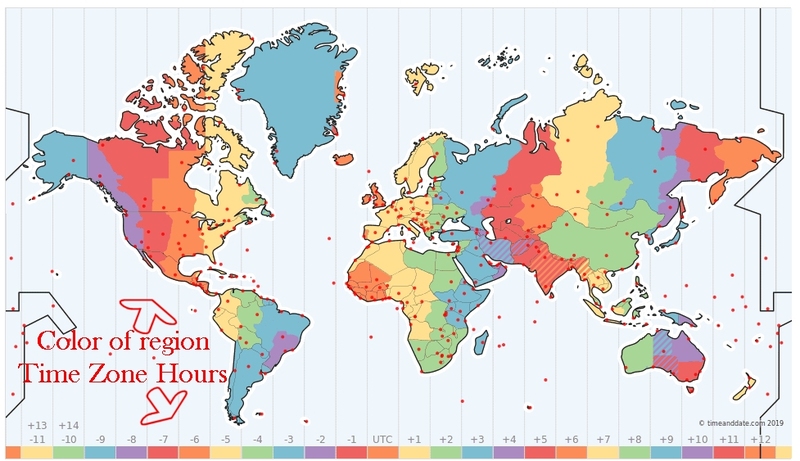 Hence the time zone regions have been color coded to assist those of you who can easily distinguish colors. This graphic (below) is a representation of that page. If you click on the map below, it will take you to the Time-and-Date web site. On the Time-and-Date map, you will notice the time zone strip at the bottom of the map that uses a minus (-) or a plus (+). Minus is for the western hemisphere, while plus is for the eastern. UTC is a "coordinate" and not a time zone. But, for all intents and purposes, UTC is the same as GMT, neither a plus nor minus, simply 0. To adjust for the saving time of daylight, one would need to increase (add) one hour to their standard time in their local time zone. As such DST for Chicago, Illinois, USA, in Central Standard Time (CST -6) converts to Central Daylight Time (CDT -5). For the eastern hemisphere, Kazakhstan Local Time (KZT +6) would become +7 if they used DST. We know it is confusing! We never said this would be easy. Please do not send us email debating the philosophy of DST. We also never said we agreed with the concept. For those of us in the Western Hemisphere, since we are always working with negative numbers, there is a page on Lunar Living that can adjust most of the Western Hemisphere Time Zones from GMT/UTC. You may notice on some areas of the map, some diagonal lines in specific eastern hemisphere areas around India and a few areas in Australia. These areas use half-hour time zone adjustments. These add a lot of complexity to calculating time for those regions. We apologize for not adding that into the calculators on Moon Tracks. For our sanity, we stayed with whole hour computations only.